Identity Stunt Vol. 1: The Fall Guy, one of 2018’s best-reviewed graphic novels, is now for sale in bookstores and comic shops worldwide! 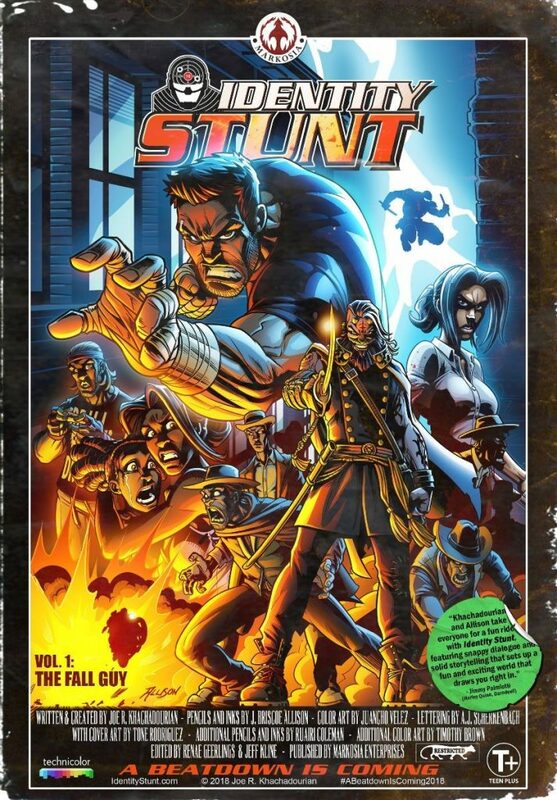 Now, Markosia Enterprises is pleased to announce the release of Identity Stunt Volume 1: The Fall Guy, collecting issues #1-4 of the critical smash, plus some never-before-seen bonus material. Professional stuntman and National Guardsman Sami Nasser is trying to simplify his complicated life — fulfilling his work commitments, managing his best friend’s self-destructive behavior, and navigating a complicated separation from his ex-wife. Just as he’s getting a handle on things, “Sam” is publicly accused of being the alter ego of Beatdown — his hometown’s notorious and unhinged vigilante — by the nefarious ganglord Dominus Smith, Beatdown’s own arch-nemesis! Squarely in the spotlight, Sam’s caught in the crosshairs of the media, law enforcement, and a slew of sociopaths. Under threat from all sides with his face plastered globally across mainstream media, Sam must battle to reclaim his identity by circumventing the police, outsmarting augmented mercenaries, and protecting his family before things take a turn for the deadly!